His full name was Robert Hamilton Hyatt. Fred Leib, one of a small group of widely read sportswriters who helped give early 20th century New York City baseball its amazing color, described today’s Pinstripe Birthday Celebrant as “one of the game’s greatest pinch-hitters.” If Leib wrote it, it must have been true. Ham Hamilton was the first player in baseball history to amass 50 pinch-hits during his career. 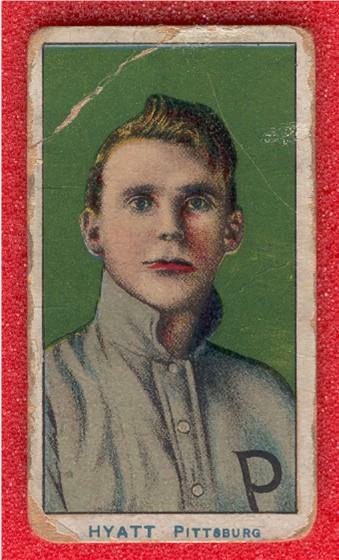 The native of North Carolina made his big league debut with the 1909 World Champion Pittsburgh Pirates and instantly exhibited a penchant for coming off the bench in key situations and delivering big hits. He averaged .299 that year and in the process he impressed Fred Clarke enough with his stick work that the Pittsburgh manager tried to make him the team’s starting first baseman the following season. That experiment failed because in addition to being a poor defensive player, Hyatt just didn’t seem to hit as well when he got more than one chance per game to do so. Probably because the Pirates didn’t think they could afford the luxury of carrying a full-time pinch-hitter, Hyatt went back to the minors in 1911. He would reappear in Pittsburgh the following season however and remained with the team as their primary pinch-hitter for the next three years. When his average took a precipitous dip to just .215 in 1915, the Pirates put him on waivers and he was claimed by the Cardinals. It was in St. Louis that Hyatt met future Yankee manager Miller Huggins, who was the starting second baseman on that 1915 St. Louis team. The two men became good friends. Three years later, Huggins was in his first season as manager for New York and with World War I causing a shortage of ballplayers, Hug needed a left handed bat for his bench. At the time, Hyatt’s contract was owned by the Boston Braves but he was playing for a minor league team in the Southern Association and leading that league in home runs. When the Yankees were able to purchase his contract from the Braves in June of that 1918 season, the one-time Cardinal teammates were reunited. Huggins gave his old buddy plenty of playing time but Ham was 33-years-old by then and could only manage a .229 batting average during his first season in New York. There would be no second season. Hyatt would end up playing in the Pacific Coast League until 1923, finally retiring for good at the age of 38. Ham Hyatt shares his birthday with another WWI era Yankee. 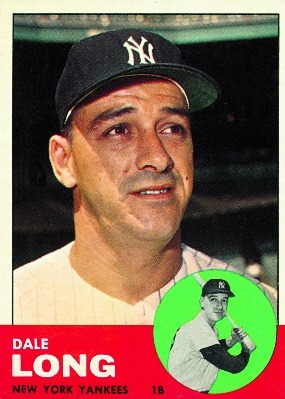 Dale Long was born in Springfield, Missouri on February 6, 1926 and then moved to Massachusetts as a young boy. A multi-talented athlete as a youngster, he starred in semi-pro football and turned down an opportunity to sign with the Green Bay Packers to give a career in baseball a shot. That career started in 1944, when Long joined the Milwaukee Brewers, then a non-affiliated double A franchise in the American Association being managed at the time by Casey Stengel. During the next ten seasons, Long spent time with fourteen different minor league ball clubs in the organizations of five different Major League teams. In 1951, he made his big league debut as a member of the Pittsburgh Pirates, where GM Branch Rickey was determined to convert Long into a left-handed catcher. That experiment lasted two pitches. He ended up on waivers that year and spent four more seasons trying to get back to the big dance. His second chance came in 1955, again with the Pirates. This time Long was ready. He averaged .291 with 16 home runs, 79 RBIs and led all of baseball with his 13 triples. The following year, Long swung his way into baseball history when he hit home runs in eight consecutive games. That stretch of power made him a national celebrity and his 27 home runs and 91 RBIs that season made him a National League All Star. 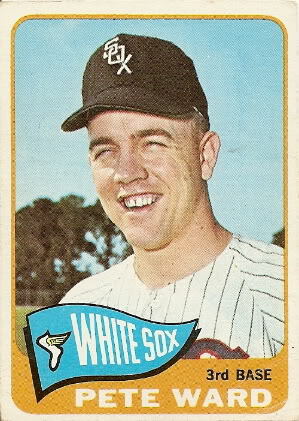 After a slow start in 1957, Long was traded to the Cubs and after three seasons in the Windy City, he was sold to the Giants just as the 1960 regular season was beginning. In August of that year, Yankee GM George Weiss was looking for some left-handed power to add to Casey Stengel’s bench and he purchased Long from San Francisco. At the time the deal was made, the big guy was hitting just .167 but when he got to the Bronx, he went on a tear. He hit a robust .366 in his 46 at bats with New York that year and made the Yankees’ postseason roster, getting a hit in three pinch-hitting appearances against his former Pirate teammates in the 1960 World Series. Long was a left-handed pull hitter who’s stroke was perfect for reaching the short porch down the old Yankee Stadium’s right field line. New York really loved having him as a pinch hitter but they had too many other stars and prospects in their employ to protect Long during the 1960 AL Expansion Draft. Sure enough, the Senators selected the veteran slugger with the 28th pick and he became the new Washington franchise’s first starting first baseman during their inaugural 1961 season. In July of 1962, the Yankees were once again in need of a left-handed pinch hitter and they offered the Senators a very good right-hand-hitting outfielder prospect from their farm system by the name of Don Lock in exchange for Long. Washington jumped at the offer and Lock became their team’s starting center fielder for the next half-decade. Long again came through in his role as a Yankee pinch-hitter and Moose Skowren’s back-up at first base. In 41 games he averaged .298 with 4 home runs and 17 RBIs. He again got to play in a World Series and this time won his first and only ring when the Yankees defeated the Giants in the 1962 Fall Classic. By the time the 1963 season rolled around, Long had reached 37 years of age and his bat and his body were slowing down. He was hitting just .200 that August, when the Yankees released him and his big league career was over. Years later, Long became a sports announcer for a local television station in my viewing area. He died in 1991, a victim of a heart attack at the age of 64. Long shares his birthday with a Yankee God and this former Yankee pitcher. Back in the late forties and early fifties, Yankee GM George Weiss would scour the rosters of the 15 other big league teams looking for what the New York media liked to call “pennant insurance.” With the platoon master, Casey Stengel calling the shots on the field in the Bronx, Weiss knew that providing the Ol’ Perfessor with one good extra bat or pitching arm was the recipe for a few extra late-season wins and quite possibly another trip to the Fall Classic. In August of 1949, Weiss had grabbed the “Big Cat,” Johnny Mize from the cross town Giants for $40,000 dollars. The primary reason the former NL batting champion was available in the first place was because Giant manager Leo Durocher was not very fond of him. When Weiss gave Mize to Stengel, Casey used him masterfully as a pinch hitter and part-time first baseman for the next five Yankee seasons. A year after getting Mize, Weiss spent another 40,000 Yankee dollars to get Johnny Hopp from the Pirates. Hopp had been a teammate of Mize’s when both played and starred for the Cardinals early in their careers. 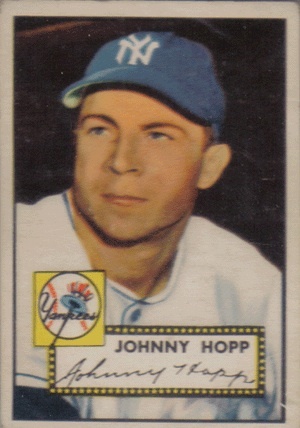 Though he didn’t have lots of power, Hopp was a great defensive first baseman, a better-than-average center fielder and a solid batsman who turned pitches into line drives with great regularity. In fact, when Weiss swung the deal to put him in pinstripes, Hopp was hitting .340. The national baseball press howled that the mysterious Weiss was somehow using the financial might of the Yankees to form a cabal of MLB owners willing to sell New York any player needed to fill a gap in the team’s roster. In actuality, no NL team in the pennant race at the time of the Hopp transaction wanted or needed a first baseman who could not hit for power. But Stengel welcomed him with open arms into his toolbox, which was more commonly referred to as the Yankee dugout. During the final month of the 1950 regular season, Hopp appeared in 19 games for New York and hit .333 with a .486 on base percentage. His timely hitting helped the Yankees hold off a very good Detroit Tiger team to win that year’s pennant by just three games. In 1951, Hopp’s age (35 at the time) began to catch up with him as injuries limited his play and had a negative impact on his batting average. The Hastings, Nebraska native was given his outright release the following year and he finished his big league career as a member of the Tigers. He retired with a .296 lifetime batting average and four World Series rings, two each with the Cardinals and Yankees. Hopp shares his July 18th birthday with this former Yankee Manager, this one-time Yankee starting pitcher and this Yankee utility infielder. The 1970 Yankee team surprised most of baseball by winning 93 games and finishing in second place in the AL East, fifteen games behind the runaway Orioles. That team was led by a talented, mostly home-grown starting pitching staff and three position players who had also come up from New York’s farm system; Roy White, Bobby Murcer and Thurman Munson. But the roster also included several big league veterans who had been acquired from other teams to fill the roles Manager Ralph Houk had in place for them. These included Danny Cater, Gene Michael, Curt Blefary, Ron Hansen and today’s Pinstripe Birthday Celebrant, Pete Ward. Ward was the Canadian born son of a professional hockey player who had excelled in baseball as a kid and been drafted by the Orioles in 1958. His path up the Baltimore farm system included a stop in the Texas League, where in order to save money, he would pitch a tent and sleep in the outfield of the park in which his Victoria/Ardmore team played their home games. He got his first taste of the big leagues with the Birds in a late-1962-season call-up. The Orioles then traded Ward and his future Yankee teammate Hansen, to the White Sox in a deal that brought Luis Aparicio to Baltimore. Ward started at third base for Chicago in 1963 and nearly won that year’s AL Rookie of the Year award. His 177 hits, 22 home runs, 84 RBI’s and .295 average helped the Sox nearly steal the AL Pennant from the Yankees that year and he finished second in the voting for the League’s best first-year player behind his teammate, pitcher Gary Peters. He followed his rookie performance up with a strong sophomore season but then injured his neck and back in a car accident and his left handed hitting stroke was never the same. He continued playing in the Windy City until 1969. After that season the Yankees picked him up in a trade and Ralph Houk used him as a back-up first baseman and pinch hitter on that 1970 Yankee team. In just 87 at-bats that season, Ward drove in 18 runs for New York and averaged .260. He was released following the season. He finished his nine-year big league career with 98 home runs and 776 hits. He then got into coaching and at one time managed in the Yankee’s minor league organization. Ward was born on July 26, 1937, in Montreal. Ward shares his birthday with this former Yankee pitcher who never seemed happy, this much more current Yankee pitcher and also this former Yankee left-fielder. Known as “the Big Cat,” Mize was an outstanding hitter and first baseman in the National League with the Giants and Cardinals for a decade, before joining the Yankees in 1949 and helping Casey Stengel win five straight World Championships. Mize had that rare ability to hit for power without striking out a lot. His career on base pecentage as a National Leaguer exceeded .400. He won a batting title with St. Louis in 1939 along with four NL home run titles and three NL RBI crowns. He was also a very good defensive first baseman and an outstanding base runner. 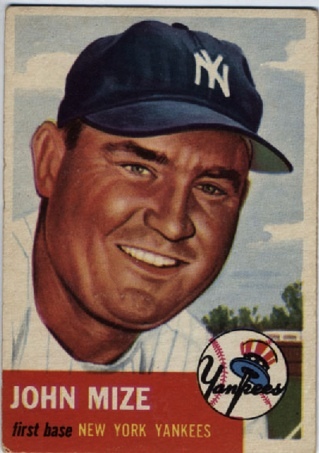 The Yankees purchased Mize from the Giants during the 1949 season for $40,000. He became the team’s best pinch hitter. The highlight of his Yankee career was the 1952 Series against the Dodgers, when Johnny hit three home runs, batted .400 and was named MVP in New York’s seven-game victory. He retired after the 1953 season. His career Slugging Average of .592 places him 17th on the All-Time List. It took a while after he retired, but in 1981, the Hall of Fame’s Veterans Committee finally recognized just how good this guy’s numbers were and put him in Cooperstown. This former Yankee, also born on January 7, is the only player in the franchise’s history to have more than 30 home runs, 100 RBIs, 40 stolen bases and bat .300 in the same season. This catcher on the great 1927 Yankee team was also born on January 7th.